My husband, who’s always thinking of my interests, sent me this link The Last Knit. I want you all to note that at the beginning of the animation the knitter’s silhouette appears to be an old woman, but when you see her you realise that she’s actually a young woman. I like that a lot because it reflects well the resurgence of knitting in the last 10 years of young knitters. Knitting isn’t something that just Grandma’s do. Although I’m very thankful that my Grandma knit because she taught my mom and they both taught me. 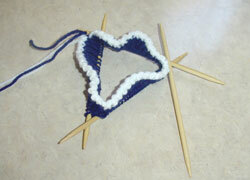 I got the wealth of two great knitter’s knowledge early on in life. Here’s the beginning of little G’s winter hat. Not much I know, but I’m glad I cast on with a contrasting colour. I think stuble hints of white will look nice. I’ll probably do a white tassel on top. I love working with dpns, especially bamboo ones. I think they look like little chopsticks.